Line painting on roads is an important highway safety initiative. Lines are used to give motorists messages about allowable or prohibitive driving procedures. Because the safety of all motorists is important, the lines on area roads are repainted each year. 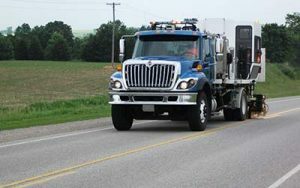 Line painting is a moving operation; there is a paint truck with a crash truck following behind when it is taking place. Flashing lights and LINE PAINTING – WET PAINT signs are mounted on the back of equipment to warn motorists that line painting is being done. Paint can take more than 5 minutes to dry depending on weather and surface conditions. When conditions are poor, painting is put on hold until conditions improve. If you do get paint on your vehicle it should be removed as soon as possible. Paint used for line painting is a water-based paint and can be removed with household cleaning products. Dampen a cloth and soak the paint to be removed with cleaning products such as Simple Green, Purple Power, or WD40 and then power wash your car at a car wash.